Tonight, Tuesday 10 at Meta House, a chance to meet artist and sculptor Chhan Dina, at the finissage of her latest collection of works, Cages Torn Open, exploring the themes of life and wildlife. From 6 pm. Meanwhile, also on Tuesday 10, across town at Cōnekla (St 51, between St 352 and St 360), Orangutan Swing presents DrawUp: drawing, talking, improvising. BYO materials, from 6 pm. Watch out for a special Khmer design edition later this month. On Wednesday 11, Meta House presents a film screening and Q&A featuring of short films by two local filmmakers, Cambodian Polen Ly, and Indian American Amit Dubey. Starts at 7 pm. 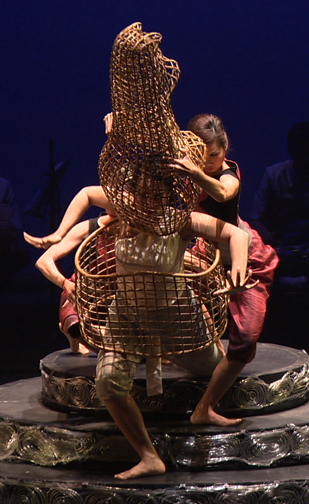 Sophiline Arts Ensemble presents A Bend in the River at Chaktomuk Hall on Friday 13 and Saturday 14 at 7 pm, then Sunday 15 at 4 pm, a work mixing dance, theatre, puppetry and music. Tickets ($10/$5/$2.50) available at Platinum Cineplex at Sorya Shopping Center, Java Café, Lotus Silk (No. 57, Street 240), Amrita Performing Arts and at the door if available. Special VIP tickets are also available that including a gourmet pre-concert reception with the principal artists on Saturday 14 (VIP tickets only at Java Café). At Friday 13 at 6.30 pm, Bophana Center (St 200 between St 63 and Monivong) is hosting a new collective performance led by a group of young Cambodian artists in which everyone will participate: the performers will be the audience will be the performers. How does noise become sound, how does sound become music? No experience or knowledge necessary… Fabian is intrigued. Free entry. On Saturday 14, Meta House presents a one day exhibition My Natural Resources, works collected by media and photography NGO Building Community Voices. Visitors are invited to vote for the best photos, with prizes present to the winning community photographer during the NGO’s national seminar on Monday . 8 am to 5 pm, Saturday only. Bophana’s Cineclub on Saturday 14 at 2 pm features script writer Ian Master leading a discussion after a screening of Jim Jarmusch’s Mystery Train. On Sunday 15 at Gasolina (bottom of St 57), a new performance by Dance Made in Cambodia, a community dance programme, that brings together 27 dancers from five organisations. The theme is cooperation and working together. 5.45 pm start, free entry. Running throughout June at The Insider Gallery at InterContinental is Pure Thomacheat, an exhibition of photographs by Michael Klinkhamer, examining Cambodian nature and the struggle for survival. Coming up soon at Phnom Penh Community College, more in the series of Wednesday evening art courses hosted by Chhan Dina: abstract acrylic painting and cubist oil painting. Contact Phnom Penh Community College for reservations. Tuesday 10 at Meta House, a chance to meet artist and sculptor Chhan Dina, at the finissage of her latest collection of works, Cages Torn Open, exploring the themes of life and wildlife. Tuesday 10 from 6 pm, Orangutan Swing presents DrawUp: drawing, talking, improvising at Cōnekla (St 51, between St 352 and St 360) from 6 pm. Wednesday 11 from 7 pm, Meta House presents a film screening and Q&A featuring of short films by two local filmmakers, Cambodian Polen Ly, and Indian American Amit Dubey. Thursday 12 from 6 pm, a special opening event for the Artwatereness’ Through Waters Cambodia project, that has come to Phnom Penh after development in Siem Reap, at the Canon Exhibition Hall, 146 Sihanouk Blvd (between St 63 and Monivong), from 6 pm. Friday 13 and Saturday 14 at 7 pm; Sunday 15 at 4 pm, Sophiline Arts Ensemble presents A Bend in the River at Chaktomuk Hall on a work mixing dance, theatre, puppetry and music. Friday 13 at 6.30 pm, Bophana Center (St 200 between St 63 and Monivong) is hosting a new collective performance led by a group of young Cambodian artists in which everyone will participate: the performers will be the audience will be the performers. Free entry. Saturday 14 only from 8 am, Meta House presents a one day exhibition My Natural Resources, works collected by media and photography NGO Building Community Voices. Saturday 14 at 2 pm, Bophana’s Cineclub features script writer Ian Master leading a discussion after a screening of Jim Jarmusch’s Mystery Train. Sunday 15 at Gasolina (bottom of St 57) at 5.45 pm, a new performance by Dance Made in Cambodia, a community dance programme, that brings together 27 dancers from five organisations. The theme is cooperation and working together. Meta House hosts Far From Angkor: Cambodians In The GDR, a photographic exhibition observing the life of Cambodians studying and training in East Germany from the 60s through to 1989.